Cataluña (in English often written Catalonia) is a region of the Iberian Peninsula that contains Barcelona and surrounding areas. Throughout Spanish history Cataluña has either had or sought independence from Spain. In practice it was often a state within a state, governing itself as it saw fit while paying taxes to Spain's central government. During the reign of Isabel II and into modern times Cataluña remains a part of Spain, though rumblings of independence continue to this day. The coins of Cataluña during the reign of Isabel II were minted in Barcelona. The mint at Barcelona had been closed following the end of the expulsion of the French in 1815. However, the machinery and tools remained there. The city's government decided to begin minting coins again in 1836. 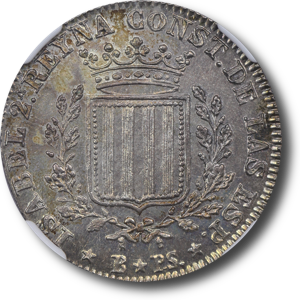 Spain's central government objected to this and issued a stern declaration requiring the Barcelona mint to be closed immediately. 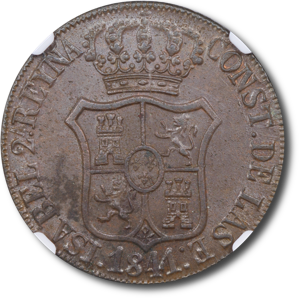 Leaders of Barcelona said they simply could not do this as coins were necessary to pay the queen's troops in the field during the Carlist War. By this reasoning the coins of Cataluña during this period might be considered "siege money" or "emergency money" in that they were ostensibly needed to pay troops and prevent invasion of the city by enemy forces. 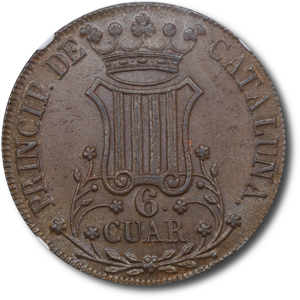 Since Spain's central government definitely needed the troops to keep fighting, the Cataluña coins were allowed and remained in circulation until the move to decimal coinage in 1848. 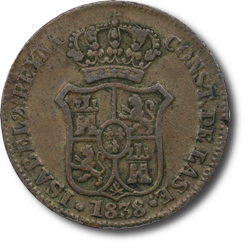 The decree of 1848 included a provision that allowed old coinage of Spain and Cataluña to be turned in for new decimal coins and many were. The treasury then melted, or in many cases simply overstruck, the old coins to make new ones. 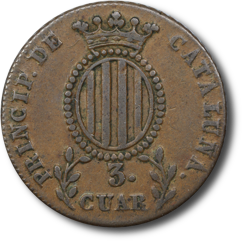 The copper coins of Cataluña exist in five major types. The III quartos, III cuartos, 3 cuartos, VI quartos, and 6 cuartos. These are abbreviated QUAR and CUAR on the actual coins. Those with QUAR are much harder to find than those with CUAR, but all are scarce in XF condition or better. These coins were essentially a form of emergency money and quantity was of greater concern than quality. Planchet flaws, porosity, and heavy die wear are common on these coins. 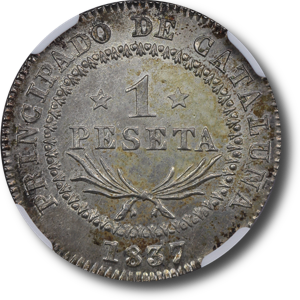 The coin pictured above is of the 3 cuartos type and exhibits signs of a heavily worn die used in its minting and wear consistent with its VF grade. The obverse has dark brown toning with some darker areas and light spotting around the devices as well as a minor planchet flaw at 3 o'clock on the rim. The reverse has attractive light brown toning throughout with a few darker areas within the central devices. The coin pictured above is an uncirculated example of the 6 cuartos type with lustrous brown surfaces. Despite a planchet flaw which appears as dark areas on the obverse, this is one of the most attractive examples of the type seen by this author. The silver coins of Cataluña exist in one type and were minted in 1836 and 1837 at the Barcelona mint. These are very difficult to find in problem free uncirculated condition. The coin pictured above is a well struck example with luster that is somewhat subdued by toning. One of the most attractive examples of the type seen by this author.